In this article, types of bonsai trees means bonsai tree species. Though plants can be categorized into groups according to styles, shapes … I’ll talk about those in other articles. Actually, there are many types of bonsai trees, and perhaps nobody knows the exact number. Yet, bonsai lovers usually know popular species; at least those are common in their habitats. We get to understand about plant species so that we’re aware of how to select the right trees to pick, to take care of them efficiently, and to create our own work of art. So, below I’ll show you several main factors to consider when you select species you like. Then, I list a few important features of potential good bonsai, which I hope to help you in choosing your trees to take care of. And finally, I’ll provide a list of common bonsai species for your reference. Which species are common in your area? Certain species are more preferred than others in certain regions, and types of popular trees change from country to country as local weather conditions differ. Where you want to grow: indoors or outdoors? A few kinds can adapt and can survive well both indoors or outdoors, but many can only live outside due to their needs of exposure to the open air or even to sunlight. How much time, effort and resources are you willing to spend on your trees? When selecting types of bonsai trees, you should keep in mind important features which help create a good bonsai later on. Branch, twigs, leaves, fruits, roots and buds, naturally in proportion to the whole size of the tree. Here I just want to list some of the most popular bonsai species, and step by step I will add more names to the list. 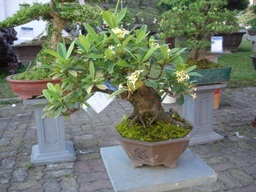 You may also want to see a full list of bonsai tree species or find out how old the oldest bonsai tree is. Last but not least, if you want to go green but don’t have enough time, patience, or adequate skills to nourish a live bonsai, then think about artificial bonsai trees, you'll get a nice solution.